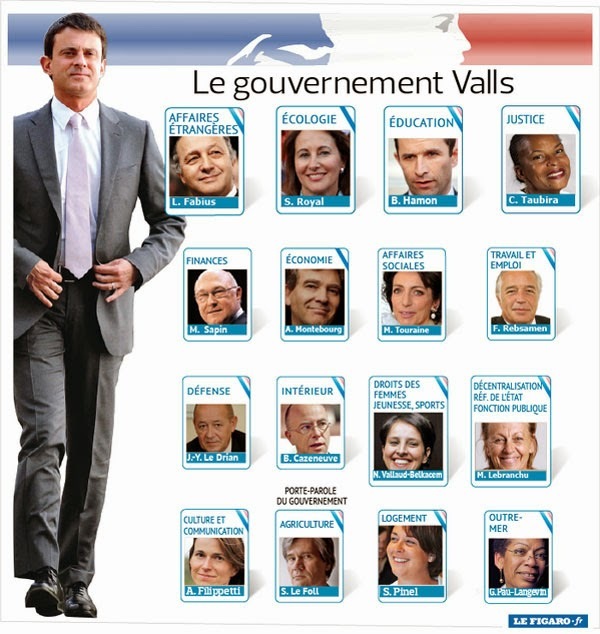 The new French cabinet has just been unveiled (the picture comes from Le Figaro‘s website). A few ministers have been re-shuffled around, but actually there are only two new entries compared to the previous team: Ségolène Royal as Environment and Energy Minister, and François Rebsamen as Employment Minister. The most interesting change took place in the Economy and Finance Ministry. Pierre Moscovici has not held onto this post (which means we may see him in Brussels soon as France’s next European Commissioner), and his portfolio has been split into two: Michel Sapin is the new Finance and Public Accounts Minister, while Arnaud Montebourg is the new Economy and Industry Minister. There’s a state, but it’s totally bankrupt. This is the reason why we had to put in place deficit reduction programmes, and no siren must divert us from this objective. It will be interesting to see how he will interact with Arnaud Montebourg, who recently described the people in charge of competition and state aid policy at the European Commission as “talibans of the law” and “fundamentalists who apply the [legislative] texts blindly to the detriment of European interests.” Montebourg is also one of the most vocal supporters of a devaluation of the euro to help French exports. We don’t know the rationale behind the decision to split the Economy and Finance Minister yet. One idea could be achieving some sort of good cop (Sapin) / bad cop (Montebourg) dynamic when negotiating with Brussels. That said, after adding the views of the new Prime Minister Manuel Valls and President François Hollande into the mix, it could become tricky to figure out who is in control and which direction the French government actually wants to head on economic policy. With regards to other ministers, Laurent Fabius, Jean-Yves Le Drian and Christiane Taubira have all kept their jobs as Foreign, Defence and Justice Ministers respectively. Budget Minister Bernard Cazeneuve is the new Interior Minister. The budget portfolio has been moved to the Public Accounts part of Sapin’s post. The next step for Manuel Valls and his cabinet is a vote of confidence in the lower house of the French Parliament, the National Assembly, which should take place on Tuesday. Follow us on Twitter @OpenEurope for more updates.